"Which are the best bingo bonuses?" is a subjective question - there are several different bonuses offered by bingo sites, and although some bonuses might seem more appealing, it really depends on what you're going to use the bonus for and what you want to get out of it that determines which is best for you. Read on to understand why.. If you're not sure which type of bingo bonus is right for you, then read through each section to understand the differences. Before I can help you though, you might want to read up about what bingo bonus wagering requirements are so you understand what i'm about to talk about! Once you're done, just click back here and carry on reading. Bingo Bonuses with no (or low) wagering requirements are in our opinion always the best bonuses to go for. They are often still very generous, and sometimes you might even find a no-depost bonus with no wagering requirements (although these are very rare and usually require that you make a deposit before being able to withdraw any winnings). You're here to win some cash right? So why risk falling victim to high wagering terms which demand you keep playing with your winnings before you can withdraw them? They're a safe bet, and most reputable brands have reasonable (low) wagering requirements; the others are often there to trick you! As mentioned above, bingo bonuses with no or low wagering requirements are always our preferred kind of bonus. You still get a decent percentage, or maximum bonus amount, but with the added benefit of not having the drama of having to wager your winnings over and over in order to withdraw them. They offer peace of mind, and are a sign of a trustworthy brand who isn't looking to trick you. If you're looking to get more game-play for your money, then you might want to go for a high percentage bonus. The percentage amount relates to the value of your first deposit. So, a 500% bonus would award you with £50 in bonus funds if you deposited £10. Naturally this appeals to a lot of people because it feels like free money - i'd take a free £50 for just £10 all day every day! But, it doesn't quite work like that. Remember that a lot of the time wagering requirements will apply to the bonus, and so if you've got £50 in bonus funds, then you may have to wager many more times that in order to withdraw any winnings. That being said, if you're just there to have a little fun and try out more games for less money then go for a bonus with a high percentage - more bang for your buck! Another thing to keep an eye out for is the maximum bonus value you can claim - there's no point having a 1,000% bonus if the most you can claim is £10! Some bingo sites may only offer low percentage bonuses (e.g. 100%) but will award you with up to £500 in bonus funds, as opposed to others that will give you a high percentage bonus (e.g. 500%), but only up to a maximum of £25. High maximum value bonuses usually appeal more to players who prefer the higher stake games - you won't get very far with a £10 bonus if the ticket price is £2! Combined with some low wagering requirements, you can really get a good deal. The following bingo sites have high maximum bonus amounts, but also have reasonably low wagering requirements. Afterall, there's no point having a £200 bonus if you have to wager it 10 times over (£2000!) before you can withdraw that full house jackpot! No-deposit bingo bonuses are a great way to try out a new bingo site (and your luck!) without having to deposit or spend any money. They can be rare to find and most of the time carry fairly harsh wagering requirements, so don't bank on being able to withdraw any winnings won off a no-deposit bonus. That being said, if all you're looking for is a bit of fun, would like to try out a particular bingo site, or just need a bit of practice, then no-deposit bonuses are the best risk-free way to get you playing for "real". Taking into account user reviews, bingo promotions and overall experience, we've selected the following bingo sites as having the best no-deposit bingo bonuses which you might want to take advantage of - after all, it won't cost you a penny! Once you've claimed your welcome bonus you won't be able to claim it again from the same bingo site. However, many bingo sites offer what's called a re-deposit bingo bonus, or re-load bonus. Re-deposit bonuses typically range from 25% to 50% – you can compare bingo bonuses and see for yourself which sites offer a re-deposit bonus and how much they'll give you. 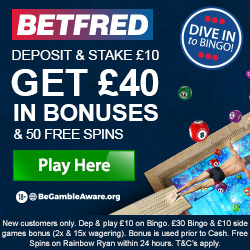 The re-deposit bonus is a reward for remaining a customer of a particular bingo site and means that with any subsequent deposit you make, after your first-time deposit, you'll get extra free bonuses to play bingo with in addition to the amount you deposit.